Our liaison in India, Amit Gordon, has shared the following information about building in Bawara. I wanted to share this with you, so you have a better sense of what our daily activities will be like. Houses in Bawana are built with brick, mortar and steel (rods to be precise). It will not be possible to tell you about the families at this stage as they are selected closer to the build dates. But what I can say is that once they have been selected I will make a profile for each home owner and prepare a document which I will give out while making the in-country briefing. 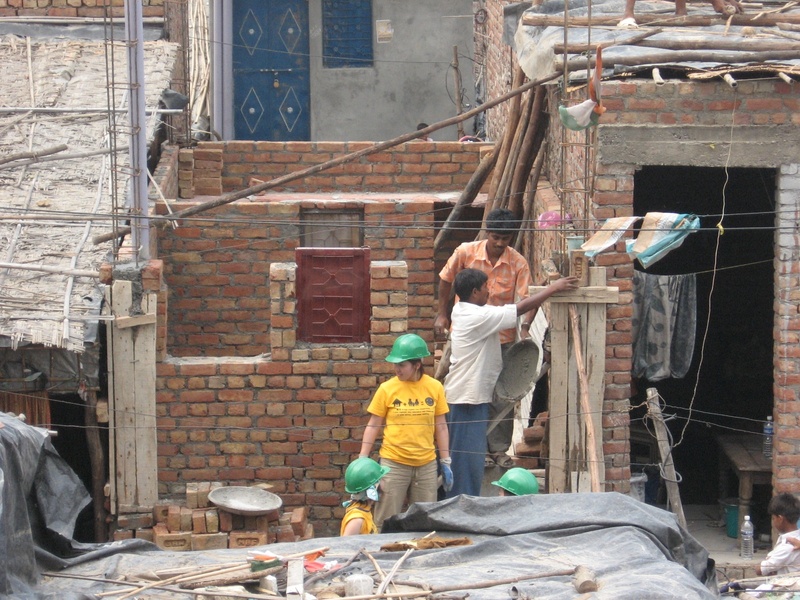 HFH has built more than 237,000 houses globally, reaching out to about 1.2 million people. On an average, one Habitat house is built every 24 minutes somewhere in the world. HFH International began working in India in 1983, and has since built over 16,000 houses and provided shelter to over 80,000 people. Today, this has emerged as one of HFH’s largest country programs anywhere in the world with offices in Bangalore, Chennai, New Delhi and Mumbai, and four satellites. Besides building homes through its regular programs, HFH has been closely involved with rebuilding communities in areas such as the Super Cyclone-hit Orissa, earthquake-ravaged Gujarat, Tsunami-damaged coastal belt of Southern India, and floods in Maharashtra. HFH India Trust has embarked on the indiaBuilds campaign, an ambitious programme to build 50,000 homes over 5 years to alleviate homelessness in the country. Northern India is highly prone to earthquakes, famines, droughts and pestilence. The latter three are guilty for high poverty rates and its consequential homelessness. North India also has the highest number of migratory populations ranging from refugees from Bangladesh and Tibet, to migratory rural-citizens across various levels of civil society. Such relocation accounts for a large daily-wage supported, floating population in North India whose living conditions speak of paucity and the want of security. The situation is further exacerbated by inequitable distribution of land, resulting in millions of landless persons. For them a roof to sleep under is a distant and unattainable dream. HFH in North India strives to make a difference to its fellow Indians in this part of the country. HRC in Delhi is responsible for executing the HFH mission across 23 states and union territories. This accounts for 65 percent of the total Indian land mass and about 64 percent of the Indian population, an estimated 655 million people. This includes reaching out to several of the poorest districts in the country, where infrastructure is grossly inadequate. Thus far, HRC Delhi has started building in eight states covering 21 districts. HRC Delhi has built homes in the states of Delhi, Rajasthan, Haryana, Uttar Pradesh, Madhya Pradesh, Orissa, Meghalaya and Assam with the help of ten partner organizations. Full-fledged operations from HRC Delhi started about three years ago. In the current financial year (FY07), the target is to reach out to 780 poorest of the poor families, and provide them simple, decent and affordable shelter. In 2004 more than 7,000 families were relocated to the Bawana Resettlement Slum, 40 km North West of the bustling heart of metropolitan Delhi, as part of a slum clearance exercise by the government. Some families could buy a plot of land from the government, but that depended in part on how long they had stayed in the old slum near the Yamuna River in east Delhi. Many families, however, could ill afford the Rs 7,000 rupees (about US$170) for a plot of 12 square yards. Others who did fork out money for the land had barely enough money left to build a decent house. Many in the Bawana Resettlement Slum were resigned to living in bamboo huts with plastic sheets for a roof. A lack of electricity, clean water and sanitation facilities added to these settlers’ problems. Many slum residents also lost their jobs as rickshaw cyclists, rag pickers or daily wage workers when they moved far away from their sources of livelihood in Delhi. This is where HFH came in to provide the much needed assistance. On August 21, 2006 life started getting better for 150 of these families. They were the first to benefit from the inauguration of a HFH project with the non-governmental organization Chetanalaya – a long term partnership that envisions more than 2,000 families having new homes. The houses being built in Bawana have a plinth area of a mere 12 feet x 9 feet – the entire house is smaller than the living room of most middle class houses! HFH’s project management ensures that they are designed to be earthquake resistant since the city lies in an area prone to such disasters. 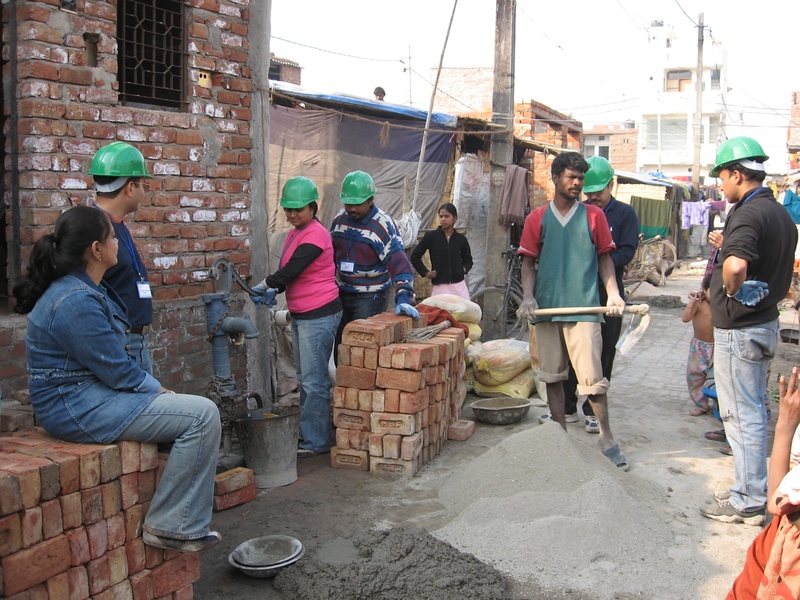 The houses are being built with red clay bricks with concrete pillars for support. To date 130 houses have been built, and the entire 150-house project would be completed by June 30, 2007. Thereafter, it is planned to go in for a second and subsequent phases so that HFH can reach out to many more of the marginalized sections of society. The number of families that we will be able to touch depends upon the funds that we in HFH are able to receive form various generous donors. Plans for the Bawana Resettlement Slum go beyond housing. Chetanalaya is supporting programmes related to strengthening of self-help groups, literacy, health, livelihood and capacity building for the first three years of the project. On the night of February 9, 2007, a fire that blazed through Bawana would have caused more extensive damage if not for HFH houses in its midst. The fire, which took the life of a three-year-old girl, burnt down 300 temporary shelters made of thatch and polythene sheets. But another 600 temporary huts were spared because two brick and concrete HFH houses stopped the fire in its destructive trail. The two HFH houses were not damaged. When the blaze hit Bawana, its residents had barely recovered from the effects of the fire on December 6, 2006 that wiped out more than 280 temporary huts. Needing warmth and lacking food, those made homeless now faced a harsh winter. The fire, reportedly due to a short circuit, destroyed people’s means of transportation and livelihood such as bicycles and pushcarts. Poultry and other livestock also perished, extinguishing the hope of income generation and food. What little savings some residents had went up in smoke, as did important land title documents. When staff from the HRC Delhi visited Bawana soon after the fire, some resilient residents were starting to rebuild their shelters with salvaged bamboo mats and plastic. The sight of the solid HFH houses has encouraged more Bawana residents to want to partner with HFH to build simple, safe, decent and affordable homes. HRC Delhi needs funds and more funds to give these poorest of the poor a life of dignity and to build up a sustainable community.